"What's Up With...?" 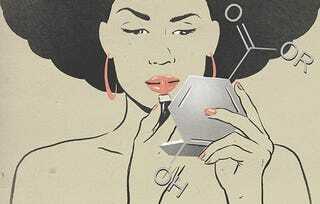 is a new regular feature exploring fearsome ingredients in beauty products. If there's one you're curious about/scared of, leave us a comment and we'll try to suss it out. After weaning my son this summer, I discovered that I was going through a second adolescence. Apparently, so was another mom at my kid's school, who came up to me, pointed out a huge zit, and said, "Oh, honey, try tea tree oil." The tea tree oil worked. But now I need a heavy-duty moisturizer because on top of the zits I have wrinkles and dry skin. (Middle age is so chill.) That brings us to today's topic. During my search for this miracle product, I kept encountering labels that declared makeups and face creams to be "Paraben Free." "Oh good," I said to the lady at beauty store who was patiently answering my questions, "but what is a paraben?" "Um, it's a thing that will probably hurt your skin or kill you," she said in a whisper. I don't know why she whispered. A cursory search of my friends revealed that they had no idea what a paraben was either, but they were definitely avoiding them. A cursory search of the internet, however, revealed that a paraben is a common cosmetic preservative. In fact, parabens are used in moisturizers, food, hair care and shaving products. They are usually listed in the ingredients as methylparaben, propylparaben, butylparaben or benzylparaben. Parabens protect products from growing bacteria. So, why do we need to be paraben free? Well, apparently in the 1990s, parebens were found to mimic estrogen and labeled "xenoestrogens." Xenoestrogens are a sub category of "endocrine disruptors." These also sound terrifying and for good reason. Endocrine disruptors can be natural or synthetic compounds that mess up your body's ability to produce hormones, which can lead to learning disabilities, attention deficit disorder, and cancer. But in there is an important caveat: endocrine disruptors can lead to these things. They don't always. And there are a lot of natural xenoestrogens. For example, beans produce them. Scientists think this is a bean's natural defense against male predators. Make a xenoestrogen, mess with a man's hormones, game, set, match. So, parabens have estrogen-like properties. And in 2004, Philippa Darbre, a British cancer researcher found parabens in breast tumors. Cue freak out. But, here is where things get trickier. Darbre's research was incomplete. It didn't involve testing to see if parabens were present elsewhere in the bodies of the patients. Also, just because something is found in a tumor doesn't mean it caused the tumor. It's like this: if when I die, the autopsy reveals I ate a lot of chicken nuggets (and I do), that doesn't mean they killed me. It was probably my toddler setting the house on fire as is evidenced by the burn marks and smoke inhalation. Also, subsequent studies have revealed that while parabens are xenoestrogens, they don't really disrupt estrogen enough to do any damage. The FDA website, which talks about itself in the third person, notes: "FDA is aware that estrogenic activity in the body is associated with certain forms of breast cancer. Although parabens can act similarly to estrogen, they have been shown to have much less estrogenic activity than the body's naturally occurring estrogen." So, if all the estrogen in your body was having a shouting match, parebens would be in the corner whispering about how you all need to shut up. Not really impacting anything at all. In 2005, the Cosmetic Ingredient Review (CIR) looked into parabens and determined that they were safe for use. Dr. Michael Campoli, a dermatologist I contacted at Fairview Lakes Medical Center, adds: "Several groups also found that paraben use in products is not unsafe at concentrations used in over-the-counter products, a view supported by the results of large epidemiological studies. Further, there is evidence that parabens, when applied to the skin, are converted in human and animal skin to a natural substance ubiquitous in plants, vegetables and human food." There are also concerns about allergies to parabens, but Campoli notes that while "a small percentage of people can develop allergies to parabens, this is very low: <0.3-1%. They have been in use for four decades and are most likely the least allergenic preservative on the market." Bottom line: All science signs point to parabens being fine. But, iIf you don't like parabens, don't use them. I'm not your mom. You're reading Millihelen, Jezebel's new home for personal beauty and style. Follow us on Twitter or send us an email.